'The Lily' swimsuit from New York swimwear label, Solid & Striped. 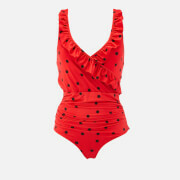 Designed by American model, Lily Aldridge, the one-piece showcases a round neckline, a low scoop back and a high cut leg to elongate the silhouette. Tie detail at the cut-out sides accentuates the design. Complete with slim shoulder straps and a full lining. Non-padded.